Day two began with the Inter-Agency Cluster on Trade and Productive Capacity. This is an inter-agency meeting that only takes place at UNCTAD. Like so many inter-agency meetings, it consisted almost entirely of agency representatives reading prewritten statements and ignoring each other. Some of the prewritten statements were genuinely very interesting, though. I made it to the meeting in time for the session on development-led globalization. Alan Kyeremartin of the ECA discussed the need to increase trade among African nations. He made the point that improving intra-African trade would also prepare the countries for global trade. I also discovered a UN body I’d never heard of before, UNCITRAL. 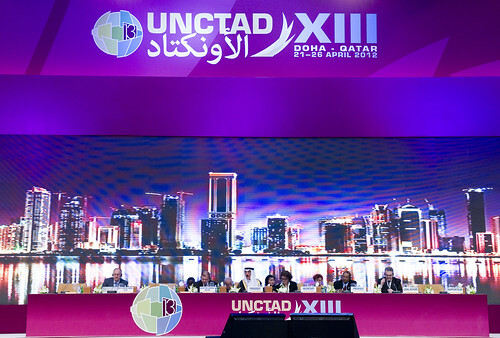 UNCITRAL works to harmonize trade regulations globally. It’s a consensus body, and sounds excruciatingly dull to work for. The UNCITRAL representative made a great point about the role of law in development, though. He said that development is grounded in a legal framework that supports free and equal legal dealings and transparency. Which, YES. In a big way. I did a little more thinking on the rule of law issue for UN Dispatch. Next, I attended the saddest little press briefing you’ve ever seen. There were maybe six media members there, and that’s if you count me. I assume all the other media was watching from the media room, but still. I don’t even have notes from the briefing. And then, we come to the big event. The opening ceremony. Welcoming speeches, an operetta about the global financial crisis. (you think I kid? I do not.) Finally, remarks from the nations attending. And that’s when you knew, for sure, you were at UNCTAD. Because they people were mad. Just about every statement demanded accountability from the wealthy nations that had caused the world financial crisis, increased government intervention in national economies, and some kind of plan for making sure this doesn’t happen again. The opening was really the high point of the day. After that, I attended the opening procedural plenary, but that’s only interesting if you’re a geek like me. (I love parliamentary procedure. It’s like elaborate dance.) It did feature Cuba throwing a monkeywrench into routine procedural matters, but that’s about it. Disclosure: My trip to Doha was funded by APCO, which has been contracted by the Qatari Ministry of Trade to support UNCTAD. They don’t have editorial control over my writing, and they don’t pay me to post. Share the post "UNCTAD – Day Two"